I love the combo of pork and fruit. Or fish and fruit. Yeah, basically I just like cooking with fruit. This one you can just shove all in one pan and forget about it until it’s time to eat! Couldn’t be easier and is very tender and delicious. Also a great way to use up apples that have been hanging around for too long. 2 nice fat pork chops. Slice the apple into 4 thick wheels- I usually just remove the seeds but don’t core them as the center star looks damn fine on a plate! Pour the juice in your baking dish and lay down 2 of the apple slices. Place a chop on each slice, sprinkle with salt and pepper and minced garlic. 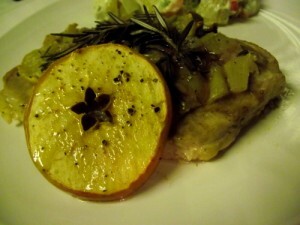 Put a sprig of rosemary on each pork chop and cover with remaining apple slices. Bake at 350 for about 30 minutes and use the top apple slice as a garnish for serving.